Vanderbilt Mansion National Historic Site in Hyde Park, New York preserves the historic estate of Frederick Vanderbilt, grandson of Cornelius Vanderbilt, the famous 19th century railroad tycoon. 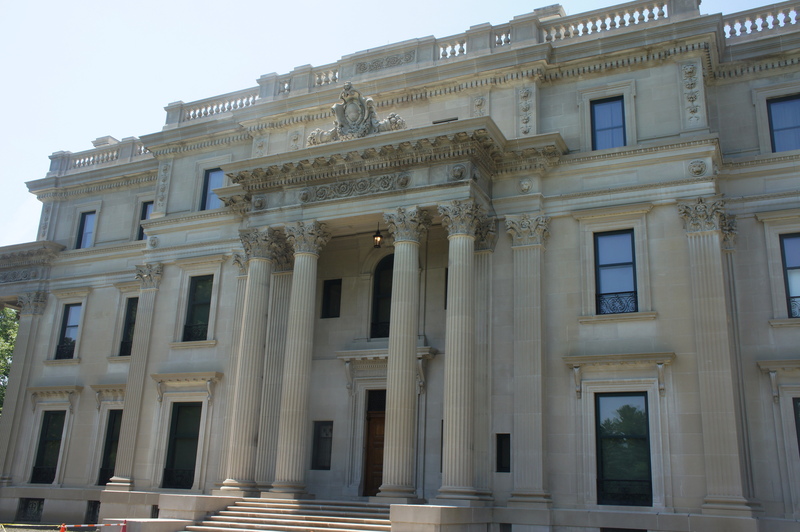 Reaping the success of his ancestors, Frederick owned considerable real estate across New York and New England and completed constructed of this mansion in Hyde Park in 1899. Now a monument to the extreme wealth and opulence of the Gilded Age, the site has been under the protection of the National Park Service since 1940. 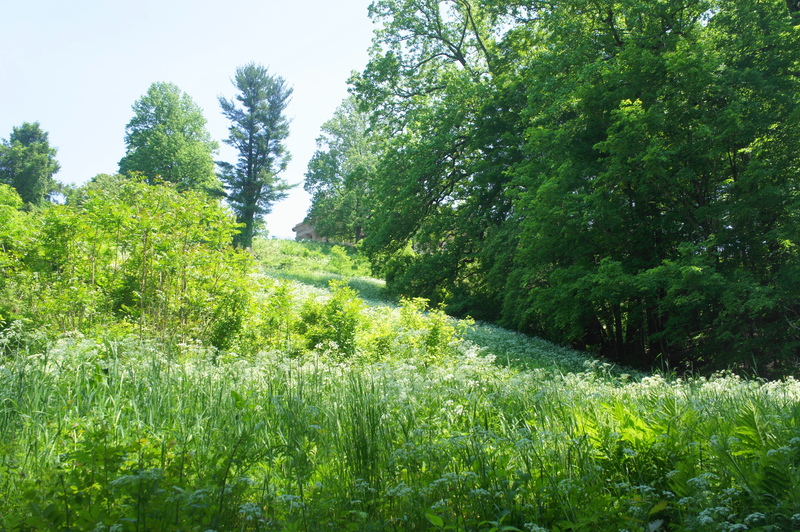 The Vanderbilt Loop—part hiking trail, part roadside walk—offers the best option to explore the historic estate on foot. 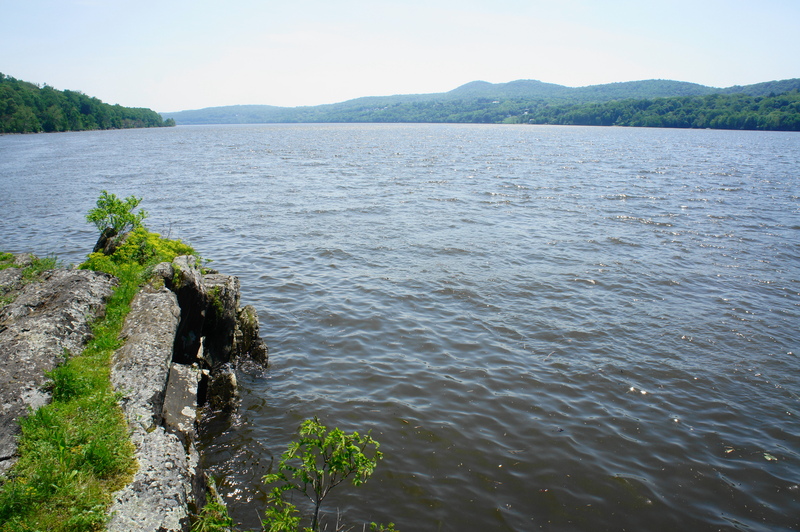 The loop traces part of the lengthy Hyde Park Trail, including a short spur to Bard Rock on the banks of the Hudson River, as well as sweeping views from along the Vanderbilt Park Road, some of the best in the area. The 2.8-mile Vanderbilt Loop begins and ends at the main parking area at the park’s Visitor Center. After exploring the exhibits in the Visitor Center, bear south on the paved path as it heads toward the Vanderbilt Mansion. Designed by McKim, Mead & White—America’s most prestigious architecture firm at the time—the mansion was developed in the Beaux-Arts style and sits atop a grassy knoll overlooking the Hudson River. In its heyday, the Vanderbilt Mansion hosted lavish parties, mostly organized by Frederick’s socialite wife Louise. As the US entered the Great Depression, however, maintaining such an estate become much more difficult, and the mansion was sold shortly after Frederick’s death in 1938. 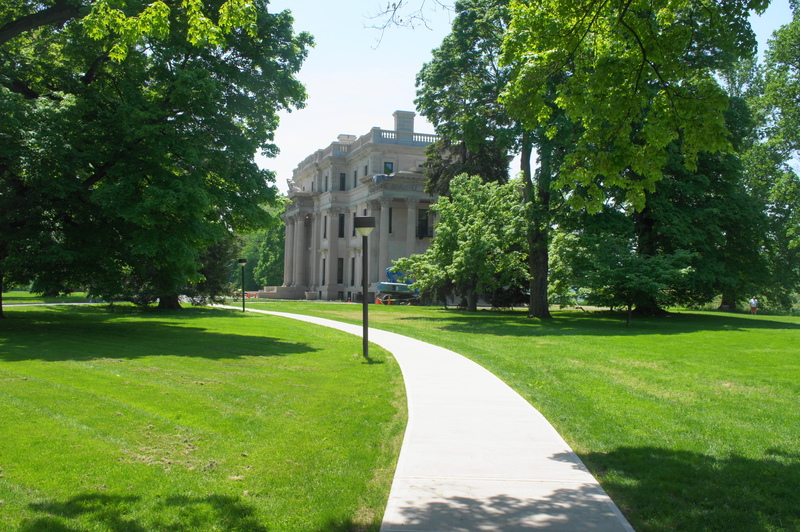 From the south side of the mansion, follow an initially faint gravel path as it continues south, hugging the edge of the woods. This is the Hyde Park Trail. The gingko tree in the field to your left is thought to have been planted as early as 1799—long before Frederick Vanderbilt bought the estate in 1895—and is one of the oldest remaining in North America. 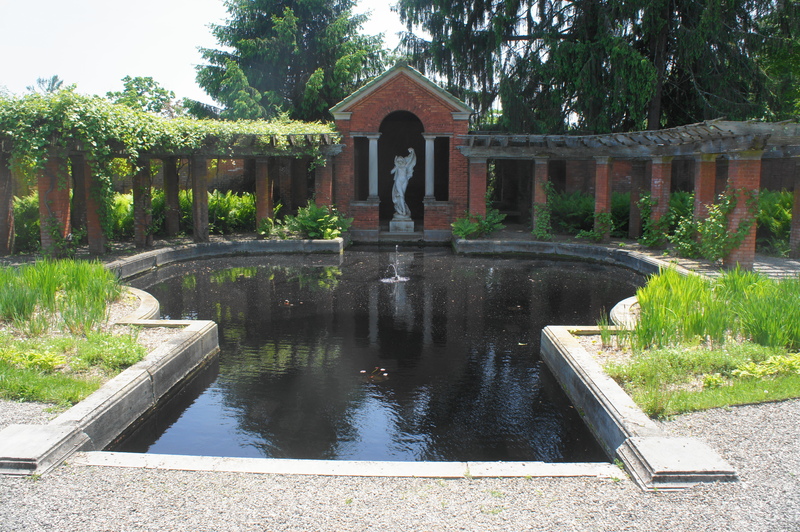 At 3/10 mile, hikers will reach the Italian Gardens on the left, an elaborate plot of flowers, hedges, and man-made ponds. The terraced gardens are maintained today by local volunteers. Beyond the gardens, follow the trail signs—marked by a blaze in the shape of a tulip leaf—as the route leaves the gravel path and plunges into the woods. Hikers quickly lose elevation as the path drops precipitously; at about the ½-mile mark, the trail disappears into Lower Gate House Way, a paved but lightly-trafficked road. On the opposite side, one can see the surprisingly powerful cascades of Crum Elbow Creek, which eventually flows into a still pond that is difficult to view. Bear right on the road and follow it for roughly 1/10 mile as it approaches the southern reaches of the estate. Just before reaching a closed gate at the park boundary, bear right on a gravel road that cuts across a neatly-trimmed field and returns to the woods. 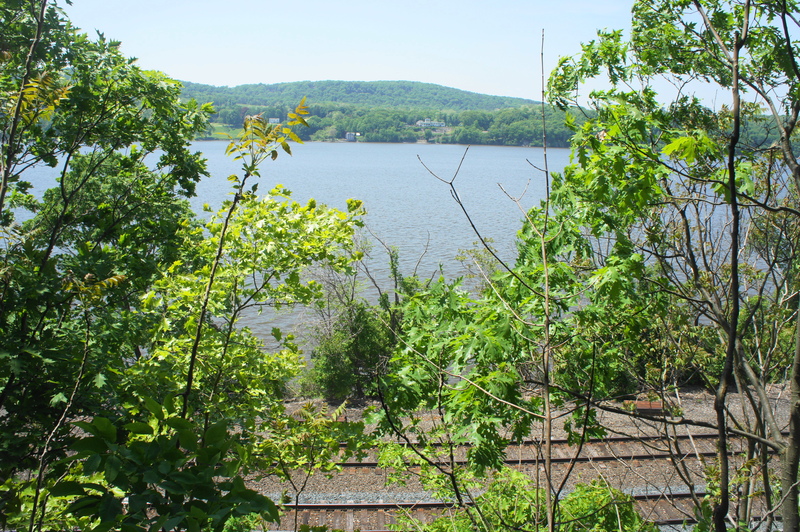 The wide path follows a minor break in the hillside and wraps around to the north, paralleling the Hudson River and railroad on the left. A break in the metal fence on the left at around ¾ mile leads to a decent viewpoint of the train track and the river beyond. As the trail continues north, occasional rock escarpments appear on the right, and a side road comes in from the right at 1.1 miles. 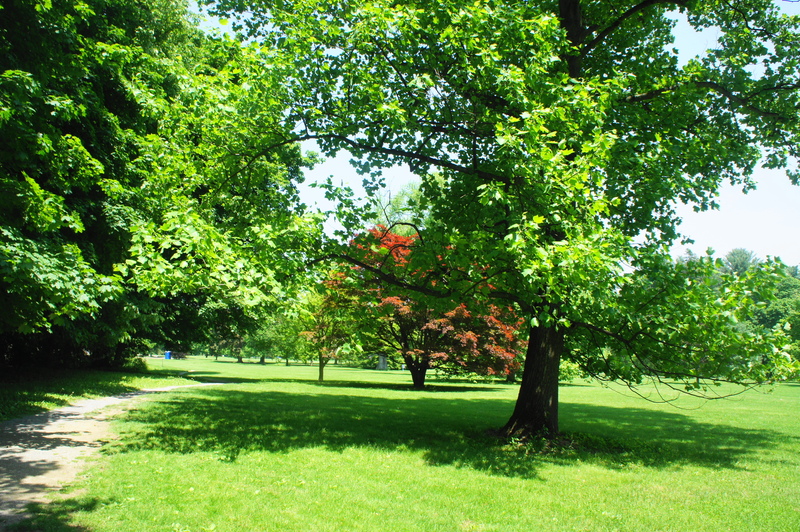 Passing under towering maple and oak trees, this section is relatively flat and straightforward. A brief clearing at 1.2 miles offers a glimpse of the mansion up on the hill to the east before the trail returns to the forest. The path drops to a local low point at about 1.35 miles, roughly level with the railroad on the left, then gradually ascends again; pine trees are more frequently seen in this area. 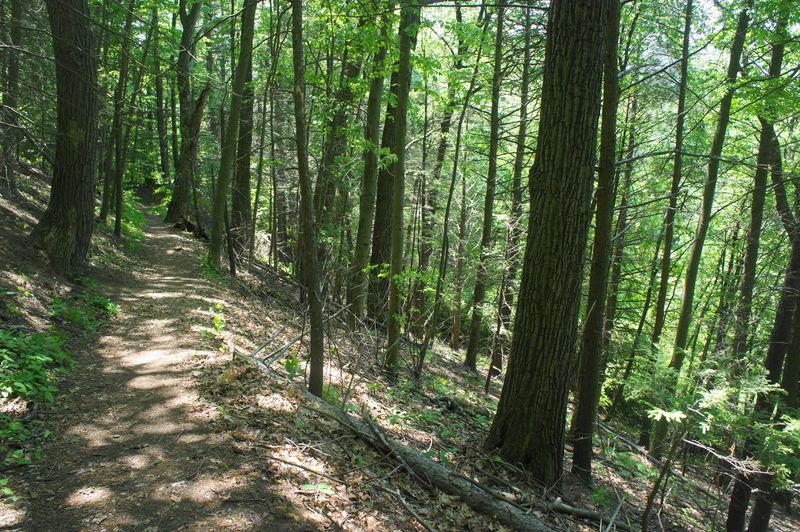 At 1.75 miles, the trail ends abruptly at the paved Bard Rock Road. Bear left for the short detour to Bard Rock, following the road as it crosses over the railroad tracks and ends at a parking area on the Hudson River. Here a small protrusion of black shale and sandstone, a rare exposure of bedrock dating to 450 million years ago, juts into the river. Bard Rock’s relatively smooth striations were formed by the passage of a glacier, which grinded down the stone surface during the last Ice Age. 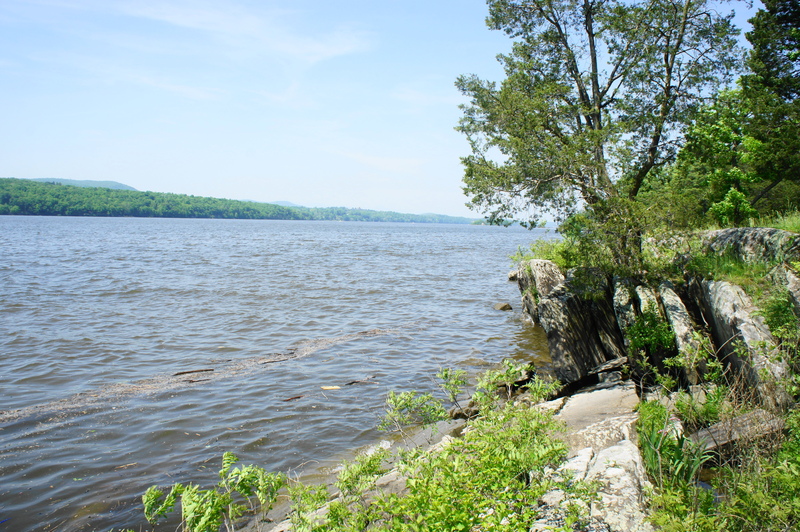 The rock extends both north and south from the parking area, with the most impressive striations situated on a small wooded peninsula to the northwest. To the south lies a set of riverside picnic tables that offer a fine spot to stop for lunch or a snack. After visiting Bard Rock, return the way you came, heading back up the road and over the railroad tracks. Passing the trail junction on the right, continue straight on Bard Rock Road as it climbs gently to the east. 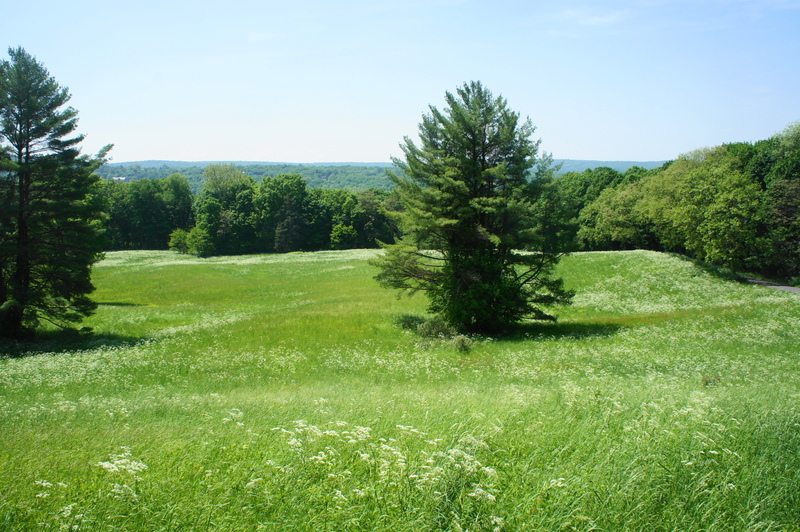 A broad field of waving grass opens up to the right, one of the most charming parts of the estate. 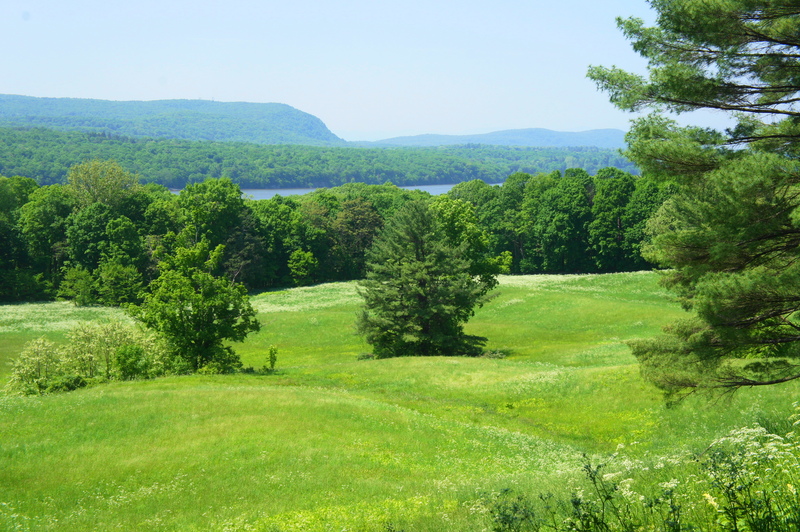 The views get better as an unmarked but well-trodden trail leaves the road on the right, climbing to a perch with a bench overlooking the hillside and Hudson River beyond. After passing through a forest of thick pines, the trail ends again at another drive, this time the one-way Vanderbilt Park Road. 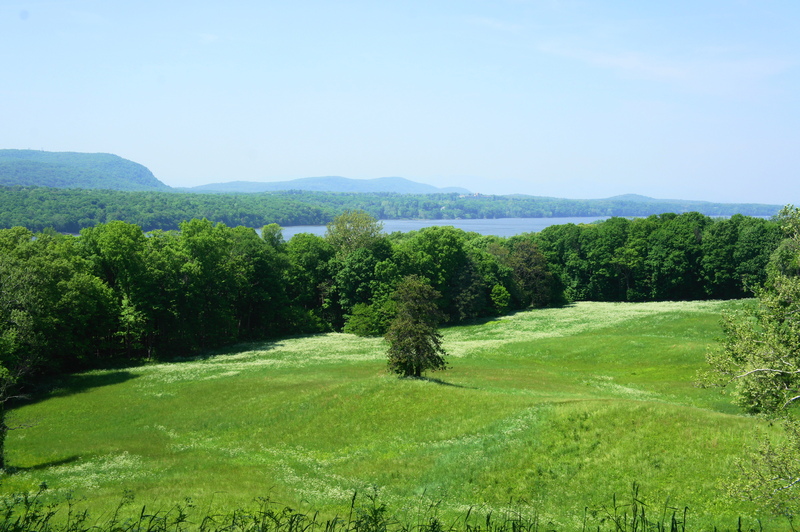 Following the road southward, the vistas are even better—culminating with a marked viewpoint known as the “Millionaire’s View.” Across the lush Hudson River Valley lies Shaupeneak Ridge, with the distant Catskill Mountains on the horizon. Continue to follow the road southward until you return to the Visitor Center and parking area. 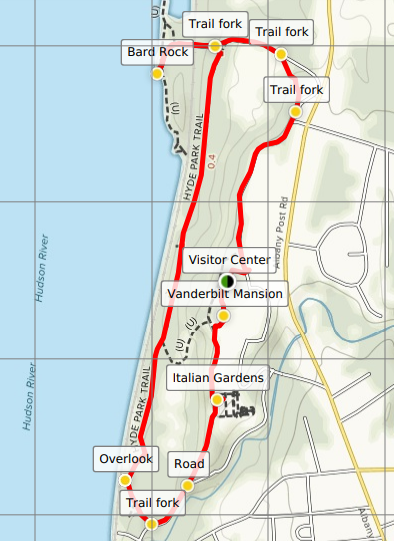 The entire Vanderbilt Loop, with the spur to Bard Rock, comes out to around 2.8 miles. Visitors to the area can also drive—or hike on the Hyde Park Trail—to the nearby Home of Franklin D. Roosevelt National Historic Site or Eleanor Roosevelt National Historic Site. 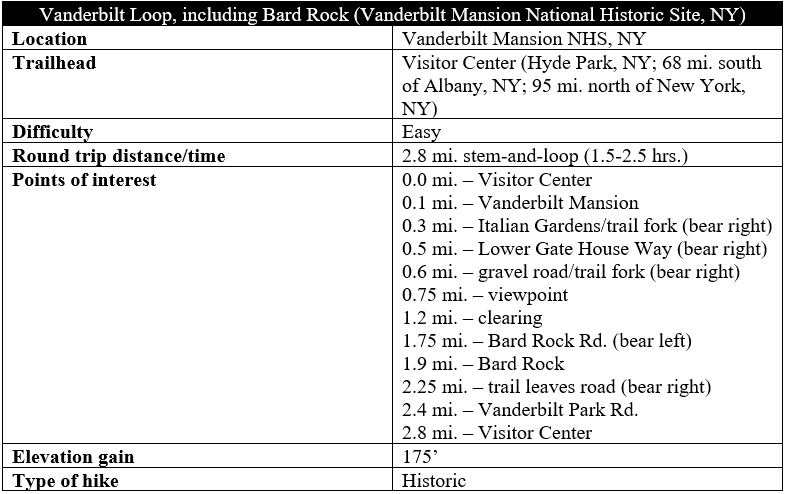 This entry was posted in Easy Hikes, Hudson River Valley, New York and tagged Bard Rock, Crum Elbow Creek, historic, Hudson River, Hudson River Valley, Hyde Park, Hyde Park Trail, Italian Gardens, New York, Vanderbilt, Vanderbilt Loop, Vanderbilt Mansion. Bookmark the permalink.